A safe, easy to use anti-snoring device that will improve your sleep and create harmony with the significant other in your life. Is someone in your life driving you crazy every night because they can’t stop snoring? They want to stop but just don’t know how to do it. Understandably, they don’t want to do hypnosis or take pills that may have side effects after frequent use. Scandinavian Formulas has a solution to this age old problem of snoring that is effective and inexpensive. It’s called Nozovent, an anti-snoring device developed by E.N.T. specialist, Bjorn Pertruson, M.D. In several clinical studies, Nozovent has demonstrated continual effectiveness to decrease snoring, help breathing, and improve sleep. 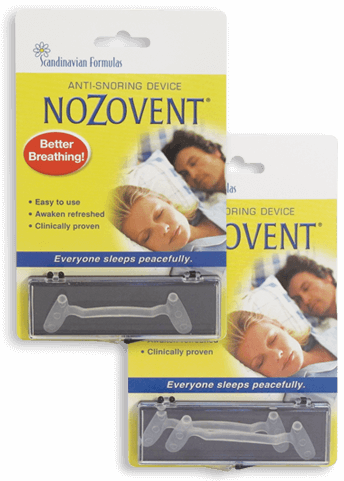 Nozovent gently widens nasal passages to increase airflow up to 50%, dramatically reducing or eliminating snoring. Nozovent is easy to use and has also been shown to eliminate unhealthy mouth breathing hence reducing the dryness of bronchial mucous. Additionally, it has been effective in minimizing asthma/bronchitis attacks and coughing. So, the next time you want to kick your significant other out of bed or move to another house, remember to pick up Nozovent at your local Health Food Store. "Peaceful sleep for Close Encounters"